As far back as last summer, the Potowmack chapter had decided to do something different at its Annual Meeting. Board members would still have to be elected, of course, and a budget passed. After that part of the meeting, the chapter had always in the past offered a field trip or walk, but this year, they chose instead to shift the focus to some the of chapter’s work in 2014. Let members see the chapter in action; and hopefully, motivate more participation. One of the big accomplishments for Potowmack this year was the publication of the NOVA Natives Plant Guide. Chapter members planned what information to include, photographed and described the plants, and wrote the text. The guide is a catalog of plants that are regionally native, along with helpful information on how to use natives in a landscape and, of course, growing tips. The guide has its own website, and you can read or download your own copy of the Guide there: Plant Nova Natives. Each year VNPS sponsors several “big” field trips, overnighters that may span as many five days. 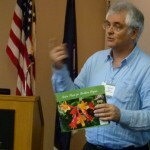 At Potowmack’s Annual Meeting this year, several members who had attended the West Virginia trip gave a brief slide show of the rare and unusual plants they discovered, a real treat for all those who could not make the trip. Some of Potowmack’s members took on a real challenge of another sort this year. They called themselves the Grass Bunch, and they set out to learn to identify the local grasses, sedges, and rushes. Their presentation inspired awe and humor in equal amounts. One member decided to purchase a microscope, a necessary tool in grass ID. He took samples home and then reported to the group on the nitty gritty details. 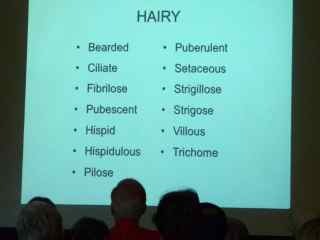 He explained how much his vocabulary had expanded through his study of the Flora of Virginia: “Look how many ways botanists have to say ‘hairy! !’ Their efforts will lead to a new publication eventually. 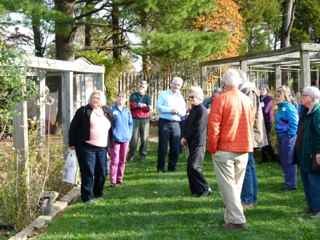 After another pass at the refreshments table, the group moved outdoors to tour the propagation beds. Potowmack is lucky to have its own spot in the back of Green Spring Gardens in which to grow natives. Plants grown there generate cash from the sales held twice a year. Participants learn loads about how to grow, transplant, re-pot, and identify natives; how to gather and prepare seeds for sowing. The group really enjoyed the tour, with its added ‘how-to” tips. In addition to these ‘featured’ works, chapter members gave to the community in many other ways this year; giving educational programs, leading walks and field trips, removing invasive plants, working with students in schools, and talking with city planners. These efforts bring rewards to the givers, and do so much to advance the cause of native plants. And so much more could be done IF – there were more people to help! A Call to Action! Can you help? The new format for Potomack’s Annual Meeting was certainly a success. Members enjoyed the celebration of the chapter’s accomplishments, and felt part of them. At the refreshment table there was time to socialize and get to know each other better. A good time was had by all. is so relevant to the challenges of today’s world. Would you like to see the new pipeline, now slated to go through primitive natural areas, either stopped, OR managed in a way that promotes minimal damage there? Would you like your HOA or community park to encourage the planting of natives? Would you like to know how you can help with native plant education in schools or other places in your community? Or would you just like to be a gardener and help with native plantings that local chapters have installed? VNPS needs you! Your chapter needs you! Do you how many people there still are in Virginia who have no idea what a native plant is? Or what their value is? There are so many opportunities; don’t miss out. Be part of the solution! 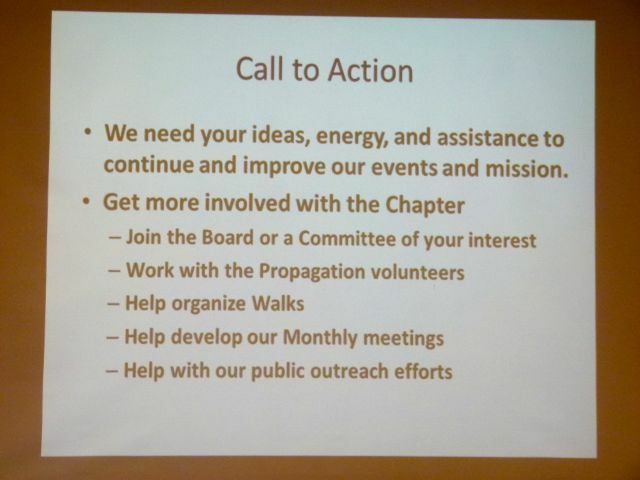 Respond to the Call for Action, attend a chapter meeting and see how you can contribute in ways that are meaningful and enjoyable to you. And don’t forget to join or renew online today.